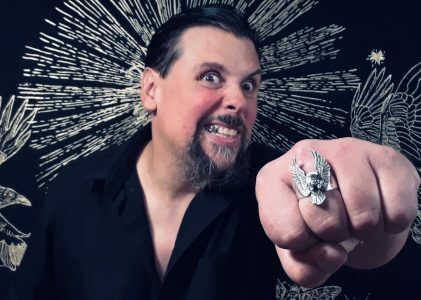 Contraband is punk and metal musician and Thomas Jefferson descendant Paul Kott’s show about politics, music, art, history, culture and much more. The first Episode of my new podcast, Contraband, is finished! Contraband will be added to all the podcast distribution avenues, like iTunes and Spotify, etc. over the coming weeks. Once we’re fully up and running, each new episode will become available on the same release day across all platforms. Every episode of Contraband will feature interesting people and explorations of hidden history and forbidden or unseen topics that cut beyond the fractious, divisive political climate we experience today. We’ll focus us on sane dialog and discussion, even actual debate – above the kindergarten “I know you are but what am I” type stuff that seems to pass for public debate these days. The first episode features an interview with Fowsia Musse, Executive Director of Maine Community Integration. This is the first of a number of planned articles, interviews, and podcasts Fowsia and I have decided to collaborate on. Each installment we work on together will focus on a specific issue that’s important to Fowsia’s personal and professional efforts. We will be examining each issue as well as exploring potential solutions and opportunities that may exist for positive steps and actions that you, the reader, can take to help address each topic. Fowsia Musse and I initially met as I was working on preliminary interviews for the book and film project I’m working on called “Edges of America”. Her work is both fascinating and critically important, and her personal story is compelling. She’s quite brilliant, and her past is woven into her present work in the tapestry of passion and determination you’d hope for in social justice advocacy. She’s the Executive Director of Maine Community Integration, a non-profit dedicated to the hard work of helping immigrants and community institutions, organizations, schools, and governments to learn how to better understand and act on their roles and responsibilities. Our society only works when everyone learns to collaborate – to team up in creating the conditions for equitable access to opportunities – for all citizens to strive for, and achieve, success. Fowsia is a refugee from war in her home country of Somalia, and in some ways that are very complicated to think about, a refugee from the violence she experienced at the hands of those who cared for her the most. She is also now a successful woman, a strong leader and activist. She is respected for her work in the community of African immigrants, and also by many among the primarily white, so-called “long-term residents” (that’s the term commonly used by everyone in Maine to describe the primarily white, non-immigrant population) in central Maine. As humans, we constantly grapple with our biologically hardwired tendency to perceive outside or unfamiliar groups and things as “others”, in an “us” and “them” context, when the fact is that conflict is inherently destructive, and collaboration is inherently creative. We have to WORK at coming together to form communities, and this has been true all over the United States, with Maine being no exception. If we can follow Fowsia’s lead, take her advice, and learn to integrate with one another, we stand to gain everything – if we fail we stand to lose not only the opportunities before us, but everything we have already gained as well. For Fowsia, and for many immigrant children, the path to a successful adult life was a trail that wound through intense trauma and pain – and there are no significant services or structures in place to help traumatized immigrant children learn how to deal with their unique pain and discover a path to empathy and healing. Fowsia has described her own dark past as the guiding star that has informed her present moment. In her story I’m reminded of the William Blake quote, where he describes the artistic experience in dealing with depression as being “touched by fire” – the brilliance of illumination being made all the more profound by having first experienced the darkness of suffering. Obviously, suffering isn’t an experience that universally develops into a call to service or a spark of inspiration, but in Fowsia’s case, it certainly has been a major influence on her work. In fact, she feels that she succeeded DESPITE her childhood traumas, not BECAUSE of them. The number of adults who suffer severe limitations due to PTSD, depressive illness, and any number of non-diagnosed but equally serious emotional and even physical symptoms that can be directly attributed to childhood trauma is not well known or adequately studied. What we do know is that the experience of the immigrant child is often, by its definition, one of difficulty, sadness, turmoil, and trauma. We have an obligation beyond a moral imperative to better understand and work to mitigate the impacts of this issue, if for no other reason than simple self-interest. We’re all served well by addressing childhood trauma in an effort to create equitable opportunities for kids whose potential may end up untapped due to the impacts of negative experiences. We all deserve the chance to earn just rewards when we work our hardest to succeed, and we can achieve the best outcomes for the broader society by leaving no one behind. I spoke with Fowsia about the impact of trauma on children in the immigrant community, what the best and most critical steps to confronting this problem look like, what her organization is doing to address this issue, and what positive steps we can all take toward helping to resolve this issue now and in the future.